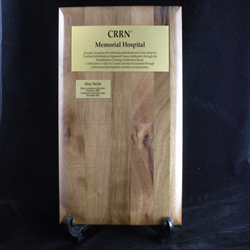 Recognize your CRRN-certified employees with plaques noting their achievement of CRRN certification. Please note: Plaques are not available via the usual Bookstore order process. You must click the link above and order via the ZIP Specialties Inc. website for your order to be processed. Recognize your achievement in becoming a Certified Rehabilitation Registered Nurse. 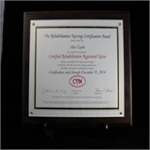 Your certificate will mount beautifully on the solid walnut plaque with a clear plexiglass cover.